There is, perhaps, no more special a day than that on which two souls are joined together in matrimony. It is a civil and public expression of the intent to make a life together. Since it is a day that the participants hope to make happen only once, getting it right is high on everyone’s priority list. A beautiful wedding arbor under which to hold the ceremony is an important part of the package. There is nothing quite like a pretty arbor to set the scene for a wedding ceremony. It doesn’t have to be expensive, however. 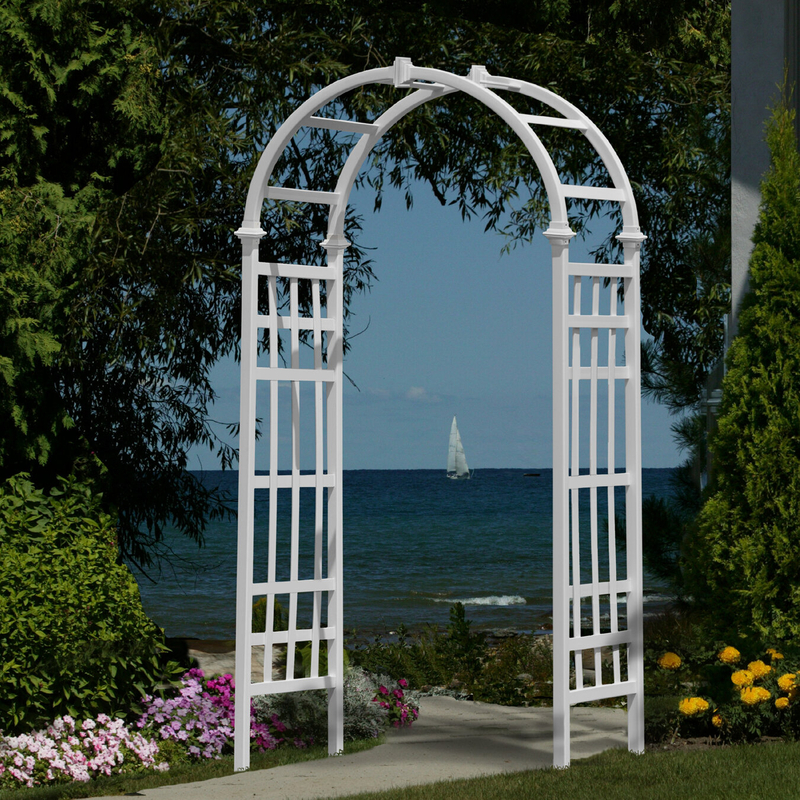 A simple, white vinyl arbor can provide a beautiful form on which to add flowers, a drape of netting or other beautiful or meaningful ornamentation. Better yet, if you place this graceful arbor in your garden, it works well with live plants as well as artificial ones. Wood will rot eventually, iron rusts and can damage plants. But vinyl is a neutral substance that does a good job resisting weather and that holds up season after season. You could easily use this pretty arbor for your wedding ceremony, and then have it as a beautiful daily reminder of your special day. A large vinyl arch gives even more opportunities for training vines or flowers over it. With almost oriental detailing on the roof support and closely “woven” side panels, this arbor provides plenty of support for your heavier, woodier flowers, such as roses or trumpet vines. It also gives a way for you to enjoy and yet contain some of the more invasive flowering vines. Some ornamental vine types are difficult to manage and can damage trees if they are allowed to invade them. This arch can be placed well away from tree areas yet can provide shade or a pretty area for a bench. It also works well as a wedding arbor or as an entrance to your garden. Its width makes it easy to place over a path or at a gateway. If it is to be part of a wedding display, it provides excellent support for floral decorations. This graceful steel gothic arch is the perfect place to train moon vines or cardinal climbers. Since it is steel, even though it is slender, it can withstand the weight of woody, climbing roses as well as the lighter annual flower vines. As a wedding arch, it is perfect. Its delicate, almost ethereal shape is perfect for draping light fabric or floral garlands. It can give an old-world feel of rich tradition and general elegance. It can also create a lovely garden nook, a gateway into a garden area, or the entrance for a processional. No matter what decorative purpose you might have for this decorative arch, it is strong and weather resistant making many years of enjoyment possible. Its powder coat finish over steel allows it to resist rain and other moisture. Although steel and iron are susceptible to moisture, the painted alloy is far more resistant than iron. Simplicity is sometimes exactly what is wanted. This pergola style arbor is made of 100% vinyl for excellent weather resistance. The vinyl structure mimics the style that might develop from the use of simple wood pieces but is unlikely to have the same problems as a trellis that wood might have. Even when treated and painted, wood is likely to decay under moist conditions. With this arbor, you can have all the beauty of wood without the difficulty of trying to preserve it. As a wedding arbor, it can be staked almost anywhere and decorated with your choice of floral offerings, greenery or swaths of fabric. The neutral style allows you to develop your choice of stylish decorations without anticipating a conflict between the style of the arbor and the style of the anticipated ceremony. When it is not doing duty as a wedding arbor, the pergola can reside in your garden. When it comes to outdoor applications, cedar is an excellent choice. The red and white striped wood is naturally weather resistant. Although it will weather to a soft gray if left on its own, you can preserve its warm color by applying a clear, weather resistant finish. It is a strong wood, and friendly toward most plants, requiring no added treatment to make it resistant. As a wedding trellis, it is a beautiful wood with its own lovely scent that can easily add a background aroma to any incense or scented candles that you might have selected. The beautiful arch is an ideal place to train or place sprays of roses. With plenty of support provided by the cross braces, you can easily add clouds of tulle, streamers or bows as part of the festive decorations. It is difficult to imagine a more naturally lovely arbor for any occasion. Again, vinyl is used to create a beautiful garden arbor. The kit for this arbor comes disassembled, but with complete instructions for putting it together. Intended for permanent installation, it is perfect for the cottage garden for a couple setting up housekeeping together. It comes with two options for the support posts, original and with an extension. Absolutely perfect for a garden entryway, what better place to plan a wedding ceremony? The entry also makes a lovely place for training seasonal flowers over it, and generally dressing up your garden. It is easy to assemble and likely to last a long time. Naturally weather resistant, it is also low maintenance – just rinse off with a garden hose. It is well-designed to give enjoyment for many years to come without requiring a lot of time and attention. By adding various annual vining flowers to it, you can change its look from year to year. For weddings, this modern arbor is just amazing. You can install one or several of the hoop-shaped arbor forms. They can be broken down into two parts for easy transport, so you can set up a wedding arch almost anywhere. But they can also be bolted down to pathways or patio paving for a more permanent installation. Several of them in a row can create a remarkable effect. Train flowers, fruit or even vegetables over these trellises for a remarkably beautiful effect. Just as a practical aside, it would be super easy to pick green beans that are trained over these forms. Inspired by hoop houses and moon gates, these simple shapes can create a remarkable garden item with a variety of uses. This is another arbor that could be installed at the home of the happy couple. Planned especially for your special day, this wooden pagoda style wedding arbor is perfect for flowers, greenery or loops of gauzy fabric. Made from western cedar, it is beautiful in its own right with that beautiful cedar aroma. Cedar is naturally weather resistant and will become a soft gray if left out without any sort of shellac or varnish to protect it. A clear finish, however, will brighten and preserve its natural reddish tone, keeping it beautiful for many years. For large families, this could mean having the perfect wedding arbor ready for several generations. Some assembly is required. All hardware parts are stainless steel to avoid rust streaking. We are certain that you will enjoy the beauty and durability of this arbor, whether for one treasured use or for many years. Two simple posts and a sturdy top make this arbor easy to mount and exceptionally versatile. Not only could you decorate it for a wedding arbor but you can also use it as a trellis for a rambling rose, a mounting for a weather station, a bird feeding station, or even a place to hang an assortment of wind chimes. The ideas are endless, just as is the grace and charge of this vinyl arbor. Maintenance for it is super simple: just spray it off with a garden hose. It’s extremely weather resistant and can be placed as an entryway or used as a trellis, a garden walk decoration or to frame a commemorative bench. Its unassuming appearance will subtly add to the beauty of your outdoor space without people even realizing how much it lends to your garden. This arbor is not the sort that should be used to hold up rose bushes or for ivy to be allowed to climb all over it. This is a gateway, a place that signifies a change from one state of being to another. As such it would make a lovely wedding arbor, especially if the arbor frames a lovely, well-developed water garden. The Japanese are well known for their refined designs and their ways of making all parts of their lives into art. This beautiful garden arbor is no exception. A wedding arbor is not as essential to most ceremonies as the ring, the cake, the happy couple or an official with the credentials needed to tie the knot and make it legal. To some cultures, however, it is an important part of the ceremony and for all cultures it is a way to make the location where the vows are said extra special. With that said, there are some things to think about when planning a wedding arbor. If the wedding is indoors, the arbor will have to be small enough to fit in the room, yet tall enough for the official and the couple to stand beneath it. Arrangements must be made to keep it upright if it is not stable when free-standing. If it is outdoors, it will need to be anchored firmly. Furthermore, whether it will be a temporary or permanent installation also should be considered. If it is to be permanent, it could be a part of the couple’s home, or it could become a gift to a local park or other favorite outdoor location. Budget is also a consideration. Looking for an arbor that’s already installed, such as a location in a family member’s garden or a local park could be a great idea for a budget-challenged event. But for those who would like to keep their arbor as part of their home, there are plenty of excellent selections. For a temporary installation, you might want to consider one of the wider arbors because they have a better chance of standing up with minimal assistance. You can always hide utilitarian items such as sandbags and stakes under imitation grass mats or mounds of floral decorations. For a temporary arbor, the ability to break it down into component parts that can be stored for future use by others is more important than weather resistance. A permanent installation could be part of the couple’s home, or it could be part of a wedding chapel’s garden. If planning for the arbor to be a permanent outdoor display, weather resistance and the type of plants on or around it become a major part of the planning. Vinyl arbors wear well, are low maintenance and are often easy on the budget. Metal arbors tend to be stronger. Powder coated stainless steel is a good choice for a heavy-duty arbor. If you prefer the look and feel of natural wood, cedar is always a good selection for outdoor use, as is redwood. Both can be given a clear finish to retain the beautiful natural color, or they can be allowed to weather to a natural gray. When not being used as a wedding arbor, arbors can support roses or other floral vines. If the arbor might be reused for other weddings, white or red rambler roses are a good choice of flower. But clematis, cardinal climbers, and moonflowers are also lovely.